Could You Be Emotionally Overeating in Your Caregiver Experience? April is Emotional Overeating Awareness Month. This is the ideal time for you as a family caregiver to learn more about emotional overeating, the impact that it can have on health and well-being, and how to detect if you might be using emotional overeating as a way to cope during your caregiver experience, or if your parent might be using it for their own coping. This can allow you to take the proper steps to reduce emotional overeating, get to the source of it, and move forward in a healthier way. Emotional overeating is described as using food to cope with emotions or feelings. This is frequently related to stress or other negative emotions and is a way for you to cope with or even avoid these feelings. 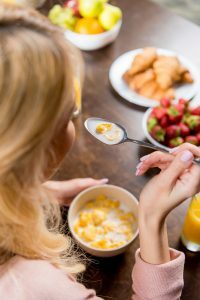 While eating this way might make you or your parent feel better in the moment, it can have lasting negative consequences for your physical, mental, and emotional health. This includes excessive weight gain, increased risk for cardiovascular disease, diabetes, and other health problems, and increased mental health issues such as depression and anxiety. For you, emotional overeating and its consequences can lead to you not being able to properly fulfill your caregiver tasks. Always reaching for food when you feel stressed, angry, sad, or lonely. Having particular foods that you tend to go to when you experience these emotions, most often unhealthy foods. Eating large quantities of food without realizing that you are doing it when you are having a bad day or feeling stressed. Hiding food so that others do not know that you’re eating it, or so that you know that you will always have access to these foods when you “need” them. Feeling guilty about what you ate after you have eaten it. Eating until you are uncomfortably full or even feel sick. Weight gain that then leads to emotional reactions, depression, shame, and withdrawal. Always responding to a difficult situation with the “need” for food. Responding to those who are going through a hard time by offering them food, such as bringing your parent a big bowl of ice cream when they are feeling lonely. In your role as a family caregiver for your elderly parent, your primary goal is to help them live the highest quality of life possible as they age in place. This means helping them at to manage health challenges that they may be suffering, and provide proper assistance for their challenges and limitations, and encourage them to maintain as much independence and engagement as possible. One of the best ways that you can pursue this goal is by starting elderly care for them. An elderly home care services provider can create a highly personalized set of services tailored specifically to your senior as an individual. This means that they will receive the services that they require to manage their individual needs in the ways that are appropriate for them according to their personality, preferences, beliefs, and goals. As a caregiver, this will give you peace of mind knowing that your parent is able to get the level of care that they need and deserve both when you are there with them and when you are not.